I recently got to know that the purple 12th century nailbinded cap which I made in december 2013 finally arrived safe in the hands of my beautiful sister Bella in the states. Actually it was meant to be a christmas present. But due to all the mundane stress I had during the turn of the year, I unfortunately forgot to send it till spring. …and then – *panic* – it seemed that the cap got lost in the mail…. I was really frightened that the cap might got lost in the mail until I got the releasing message from my sister. Therefore I decided to celebrate the arrival and to revisit my posting about this project for you. …I am sorry, but the following in-depth details are restricted to Advanced and Premium members of my blog. This 12th century nailbinding project is inspired by an italian 12th century fresco showing foolish virgins. 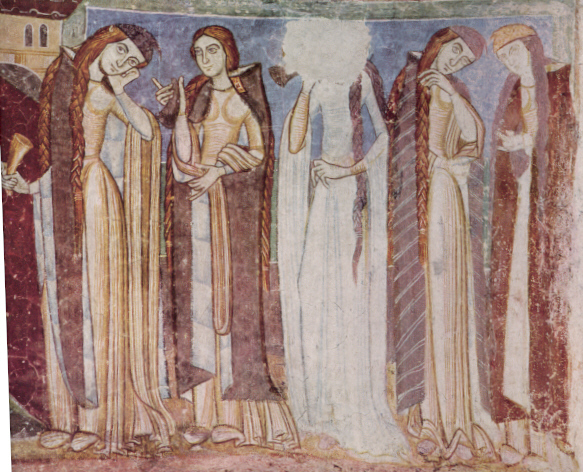 You can find a picture of this fresco here: The Bliaut throughout 12th Century Europe. This page gives following information concerning the source: “A frecso dipicting the story of “the foolish virgins” from Castel d’Appiano in Trentino Alto Adige, Italy”. For the lords and ladies among you who recreate 12th century – this detail is rather rare as far as I can tell concerning the pictures I have seen of extant paintings/illuminations/frescos till now. After long discussions with a friend of mine from France, who is an art historian, I still think that this might have been a cap that was actually worn in the 12th century. But there is also the possibility that this cap has just an allegorical meaning (concerning the 12th century). When you follow the link and look at the picture, this ladies are wearing closely fitted dresses with overly full and long fashionable sleeves, beautiful cloaks with fur collar,… Therefore I don’t really think that they would wear something “outdated” and just allegorical on their hats, wile they are otherwise wearing “modern” and “fashionable” clothing. Unfortunately not many things from the 12th century survived the last centuries (wars, fires, were thrown away,…) besides some really important or precious pieces. Therefore my personal intend has always been to recreate what I can see and also can afford and even more important: what I like. Long time ago I decided that the approach of many reenactment groups – just to recreate what can be 100% documented with 3 or more sources,… – is just not enough for me. I wanted more projects, more possibilities and actually – more fun and creativity. Please keep that in mind when you are looking at my projects. I don’t focus on copying extant pieces – I am focussing on partly recreating “old” existing objets as well as creating “new” objects based on extant objects, techniques, styles… and my personal preferences. Error: Error validating access token: Session has expired on Saturday, 23-Feb-19 11:41:58 PST. The current time is Friday, 26-Apr-19 03:45:40 PDT.